Your Bank Account Full Of Time - How Are You Spending It? Each and every morning we are given an account with 86,400 seconds worth of time in it, and it’s up to us to make sure we use that gift efficiently and effectively. If someone gave you that much money every day and told you to spend it, you’d make sure you did so, correct? Well, you’re given that much time every single day to live up to your potential, and once it’s gone, it’s gone. Over the years, I have talked a lot on this site about how certain lifestyle choices can negatively affect our financial bottom line. From lattes to cigarette smoking to lavish vacations on credit, I’ve covered the gamut of how our choices in life can be damaging to our fiscal health. But reading this saying, something else really hit home — all the talk in the world about money doesn’t matter if we don’t take full advantage of the free “bank account” we are given each morning. My father died when he was just 45 years old. He didn’t expect to die so young, no one ever does. Did he make the most of his “bank account” full of time? Who knows, but I’d like to think he did. But as I am rapidly approaching 40 now, I am really giving thought to how I am spending my one lifetime here on earth. Am I making the most of it? Am I worrying too much about money missing out on my life? Am I wasting valuable time fretting over past decisions that I can no longer do anything about? Am I avoiding moving forward? Being concerned about your financial situation is, of course, a very important matter. Everyone needs money to survive, to buy food for a family or to put a roof over their head. Money does make the world go ’round, there is no escaping this. But while this site has been focused, and will remain focused, on all issues surrounding money – credit, debt, investing, shopping – I beg you to also consider your other incredibly important asset you start each day with – time. Without time, money is useless. It’s up to you to start using both money and time to the best of your ability, in order to take full advantage of both. Remember – this is your one and only time around on this rock. Don’t waste all of it being concerned solely with money, as you can’t take with you when you go anyway. 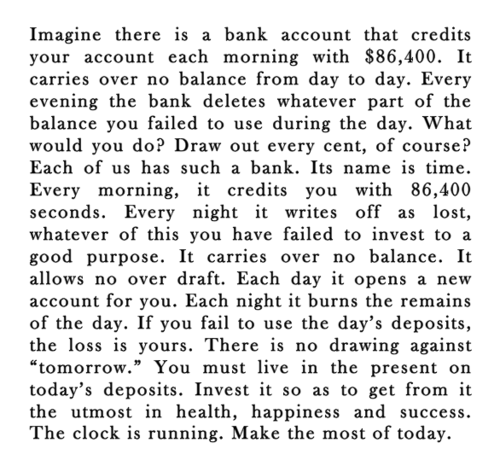 Good post to tell the value of time. Time never stops for you it goes on. And all depends on us how we utilize the passing time. I would like to spend more and more time with my family. As they are the one for whom i earn. 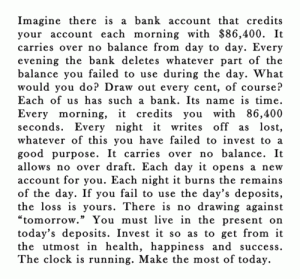 Nice to read a post on a Money blog which does not just say that: ‘Time is Money’. Time is one of our most valuable ‘commodities’ but it should not be overlooked that a lot of time from the ‘time-account’ can be wasted if there are constant worries about the ‘money-account’ or too much time has to be spent on making sure that the ‘money-account’ does not crash. Finding the right balance is the art in this situation. New learners should get in reading this. It teaches you to start initially and increase your level gradually.